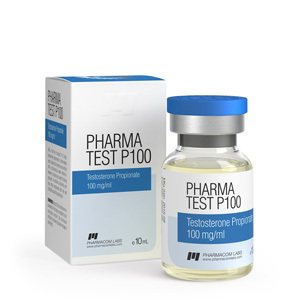 Pharmacom Labs Pharma test P100 is a highly effective anabolic drug containing propionate as the main active component of testosterone (a high-speed testosterone ester). You can order Pharma Test P100 through our store. The testosterone molecule attached to propionic acid ester mainly determines the pharmacological properties of this steroid. Purchasing Pharma Test P100 from Pharmacom Labs may not be the best solution for those athletes who are extremely negative about the need for regular injections with short interruptions. However, on the other hand, the “short” nature of the steroid can act as an advantage. So, for example, if you detect side reactions associated with this steroid, you can quickly cancel it and all side reactions will be eliminated. Although many testosterone-based steroids tend to retain water in the body during the course, this same steroid, provided that the dosages are selected correctly, taking into account the individual needs of the body, will not retain water (or the delay will be minimal). All this against the background of the relatively low cost of this steroid (the price Farmatest P100 from Pharmacom Labs is available for athletes of different levels of financial security). Why should you buy Pharma test P100 from Pharmacom? Accelerated metabolism helps to activate the processes of burning adipose tissue and increase appetite.